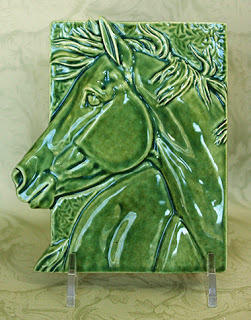 Here is the first of the finished “Windblown” plaques. I wasn’t sure how the plaque would turn out in an art glaze. It was really designed so that the horse would be glazed in a realistic color while the background would be finished with an art glaze. (The leaf texture is there to take advantage of how art glazes flow into the recesses of the design.) But I like the all-over art glaze after all. The plaque also shrank quite a bit. I had already noticed that my current batch of slip had a slightly higher shrink ratio than past batches. Whereas before the shrinkage was negligible, the new slip (using the same recipe) had an overall shrinkage rate of about 6%. For some reason, though, this particular piece is shrinking around 9%. You can see the dramatic difference between the final piece and the first original here. The finished one is actually one mold further from the original, since the mane was added to a casting from it, but that’s still a lot of shrink for one generation of moldmaking. 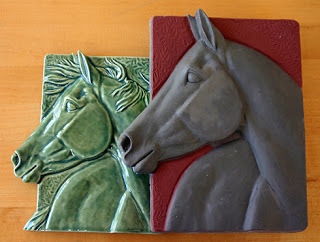 It took quite a few generations of molds to shrink the Celtic Pony medallion that far. I’m not sure why the shrinkage is so different from the pony. Perhaps the fact that it’s rectangular, or has less depth. Or maybe because it can be poured with thinner walls. The question does make me wish I had studied ceramics in school, rather than graphic design! But whatever the reason, it certainly will make reducing the design to ornament and then to pendant size easier. In the meantime I will be learning this mold’s idosyncracies. They all have them! How thick the slip, how thick the walls, how long to leave the drained casting in the mold… each mold wants something different. So you always lose a fair number of castings from the early life of the first mold. The trick is to write all the preferences down so you don’t have to relearn it all the next time the mold gets used! 2 Responses to The finished product! Gorgeous, absolutely gorgeous! YOu “should” be sculpting. You are sweet, Mel. Unfortunately the only thing I do more slowly than paint is sculpt!